Security Cameras: Camera systems providing a 360-degree-view have been added to the Sage Hall Computer-Based Testing Center and several classrooms at Discovery Park to help ensure secure testing. The project was completed in the summer of 2016 in response to faculty requests for an expanded camera configuration. 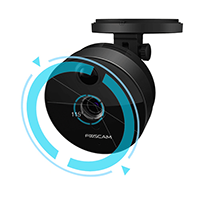 These camera systems use more than 40 cameras, each with a wide 115-degree angle of view. The cameras are placed strategically to ensure full coverage of every student and every screen. The cameras are Foscam C1 720P IP cameras. The server setup powering the cameras has the following specifications. Live Proctoring: The Sage Hall Computer-Based Testing Center offers live proctoring of exams. Our student-testing monitors are currently-enrolled UNT graduate students and provide added security and assistance during the testing process. With the combination of our extensive camera system, the exam security tools provided by Canvas, and our in-room monitors, the maximum level of academic integrity in online testing is available. Testing center staff members continuously monitor the camera feeds on numerous screens throughout exam times. Camera footage is stored digitally and can be reviewed as needed, should a question arise. Secure-Testing Tools: The staff of UNT's Center for Learning Experimentation, Application and Research, CLEAR, will assist faculty in the development and use of secure-testing tools, such as the Canvas Learning Management System features and Respondus lockdown browser. Members of the CLEAR team will assist in the explanation to faculty/staff testing stakeholders, the importance of testing security and the providing of appropriate proctoring personnel. Faculty and staff utilizing the Sage Hall Computer-Based Testing Center are expected to learn how to use secure-testing tools for testing center exams. All tests in the center will be assumed to have those security controls in place, such as lockdown browser, a cell phone policy, etc., unless alternative technical arrangements have been made in advance by faculty or staff administering the testing. IMPORTANT: All persons and departments using the Sage Hall Computer-Based Testing Center are responsible for providing their own testing assistants and proctors. Additionally, faculty and staff are responsible for developing and thoroughly documenting and explaining to their affected students the policies regarding cell phone use and abuse, presentation of ID cards, and other possible cheating practices and outcomes. If you have any questions about the Sage Hall CBTC, please contact Elizabeth Hinkle-Turner, director, Instructional IT Services.